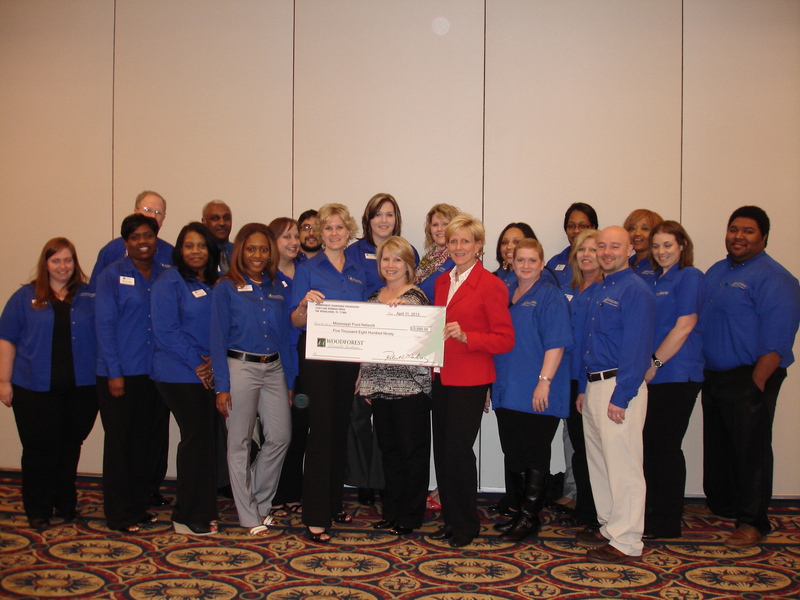 Photo Caption:Front row - (L to R) Woodforest National Bank, Mississippi Branch Managers: Heather Lightman, Grenada, MS; Miranda Sanders, Vicksburg, MS; Toroda Catchings, Clinton, MS; Melissa Simmons, Tupelo, MS; Woodforest National Bank, Regional Vice President, Misty Gaskamp; Programs Director, Mississippi Food Network, Cassandra Guess; Woodforest Charitable Foundation Director of Operations, Shelly Lynch; Woodforest National Bank, Mississippi Branch Managers: Melissa Brigance, Corinth, MS; Justin Green, West Point, MS; Patricia Pack, Pascagoula, MS; Dixie Jenkins, Gulfport, MS; and Talmadge Perkins, Clarksdale, MS. Back row – (L to R) Woodforest National Bank, Mississippi Branch Managers: Glen Crawford, Ocean Springs, MS; Jonathan Buie, Hazlehurst, MS; Roberta Swatsenberg, Amory, MS; Jacob Ainsworth, Waveland, MS; Holleigh Smith, Dlberville, MS; Deanna Thacker, Booneville, MS; Porchea Brown, Brookhaven, MS; Ieasha Roberson, Indianola, MS; and Linda Young, Starkville, MS.
Jackson, MS – On a continual basis Woodforest National Bank employees perform a multitude of fundraising events benefitting the Woodforest Charitable Foundation. Both Woodforest National Bank and Woodforest Charitable Foundation are committed to making a positive impact in the communities in which Woodforest serves. This partnership benefits the community and organizations such as Mississippi Food Network, which recently received a $5,890 donation, from the Woodforest Charitable Foundation. Mississippi Food Network was founded in 1983 by a group of concerned and compassionate people that recognized the need for a food bank, with a warehouse facility that would accumulate, store and distribute food and household items for charities that would make the final distribution to needy people in the community. For 30 years the Mississippi Food Network has been serving multiple counties, distributing approximately 16.5 million pounds of food annually. Mississippi Food Network supports numerous feeding programs including Afterschool Snack Program, Summer Food Service, Nutrition Education, and BackPack programs. The BackPack Program is designed to meet the needs of hungry children at times when other resources are not available, such as weekends and school vacations. Backpacks are filled with food that children take home and discreetly distributed on the last day before the weekend or holiday vacation.